Soutzoukakia is one of the most appreciated Greek dishes. They’re fluffy meatballs flavored with cumin and cooked in a rich tomato sauce. Put the bread slices in a bowl and pour over the milk. Let rest for a few minutes. Take the slices and squeeze until most of the milk has been reduced. Rub the bread with hands in order to shape it into small crumbles. Place the meat in large bowl. Add crumbled bread, egg, olive oil, garlic, spices, salt, pepper and mix with hands until all ingredients are well combined. Cover the bowl with plastic wrap and put it in the fridge. In a large pan heat some olive oil. Sauté the onion for a few minutes until it softens and becomes light brown. Add tomatoes with juices, tomato paste, salt, pepper, spices and cook. Take the ground meat mixture out of the fridge. Form it into small cylinders. Pamper lightly with flour. Heat olive oil in a large frying pan. Fry the meatballs- fry them properly on all sides. 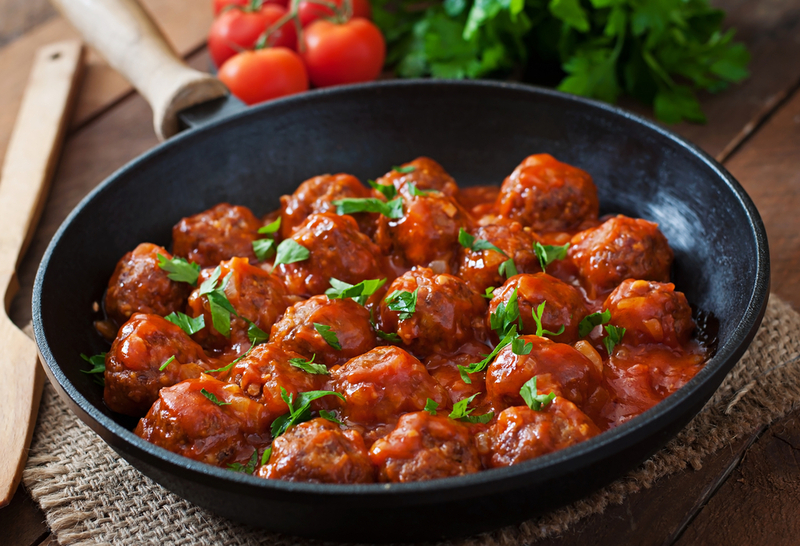 Once all meatballs are ready place them gently in the tomato sauce and cook until tomato sauce has thickened. Serve with rice (traditional way) or mashed potatoes. This entry was posted in Around the Greek table, THE ART OF LIVING WELL / and tagged comfort food, meat on 26 May, 2017 by George Papageorgiou.